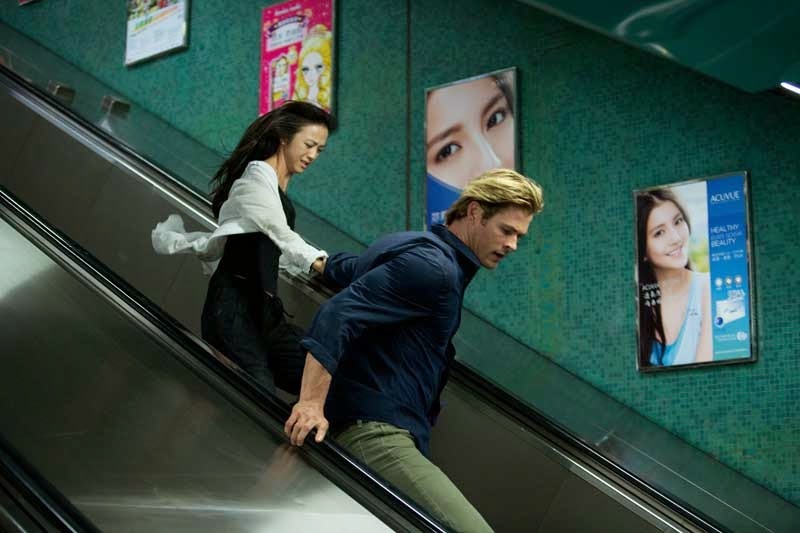 Blackhat is Michael Mann's latest cinematic foray and his first since 2009's Public Enemies. It is pretty interesting to look at Mann's filmography. He is far from a prolific director, but more often than not, the films he makes are of very good quality. I even thought his Miami Vice was pretty good, plus it has some really good gunfights. When it comes to Blackhat, I was not sure if it was going to be a movie for me as it looks like they were going for this computer themed movie built on the back of Thor. Seemed like an odd pairing that was not destined to work. As it turns out, the movie is not what I expected and it surprisingly works. 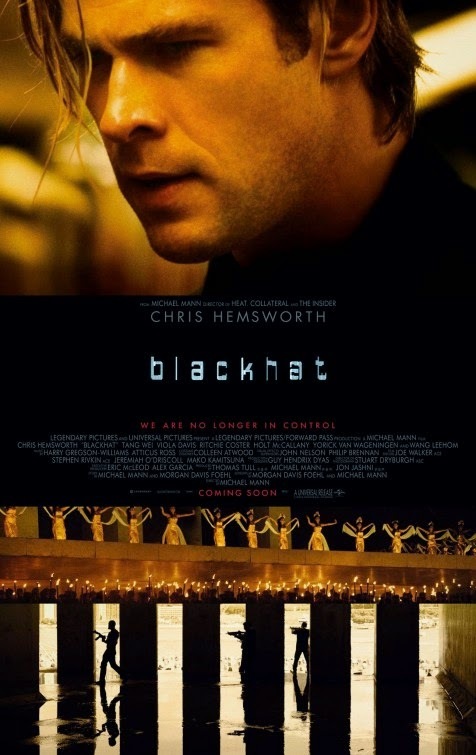 The base idea of Blackhat, as described in the trailer is quite appropriate considering recent events. There is a line in the trailer about giving up control as soon as you log on and how the bad guy hacker in this film can target anyone, anything, anywhere. Now, those lines are not actually in the film, but they do paint a compelling picture, a frightening picture, when you pair those ideas with the Sony hack and the various retailer breaches. As for the movie, it turns out to be a little bit different. Blackhat brings big budget action into contact with slice of life art house. It is a movie made for the masses that challenges them to go for the ride. None of this makes it a good movie, and I may be fooling myself on some level about actually liking it myself. The thing is, this movie does not really seem to have a purpose. It has a beginning, but it just seems like a setup for something else, something different than some form of terrorist plot. 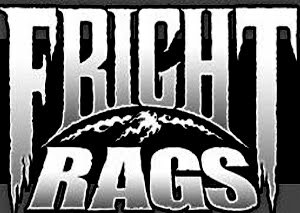 The globetrotting is a smokescreen that amounts to very little. Film for the sake of film. To try and wring a traditional film out of these parts is a fool's path. It may not be an incorrect want, and it may be the path by which this is proven to not be a good film. Fortunately, it is not the only interpretation. I am not even sure I want to read all that much into it. From the opening with the Chinese nuclear facility attack, creatively visualized by following the electrical impulses through the circuitry, we are presented with the Macguffin. We are never shown the bad guy until the climax, I am not sure it is ever really about him, he is merely a means to an end. At the center of the movie is Nick Hathaway (Thor, err, Chris Hemsworth). He is a genius hacker who misused his skills and is spending 15-years in prison. The reveal that the nuclear plant explosion was caused by a hacker turns out to be his get out of jail free card. He is sprung by a joint US/Chinese task force charged with tracking down the man responsible. What follows is a journey of redemption, discovery, and a little gun play. We learn that Nick is not such a bad guy, but will not let himself be constrained by legality when hunting down his target. The story seems inconsequential. When it comes right down to it, without spending more time with the villain, we have no way of understanding him. The motives are never explained, never known, and have no real bearing on anything. It is more about watching Hathaway deal with who and what he is and how he relates to those around him, not to mention their effect on him. Now, while the story is not really the focus, the flow, look, and feel of the movie is. Michael Mann has an amazing ability to bring locations to life. Take a look at Collateral and how he made that city feel, not unlike a full blown character. It is a very similar situation here. The cinematography and art design bring this movie to life, give it purpose. Everything is alive. Add in the sound design, the sound of the keyboard is more like a weapon, gunshots and shootouts have a certain undeniable quality to them. I would swear that the hacking story is the clothesline on which Mann decided to experiment with the look and the sound of a motion picture. It is a good film. Blackhat is not what I expected. I cannot really say that it serves a purpose, but it is surprisingly involving and affecting. No, I never bought Hemsworth as a master hacker, but he demonstrated some charisma that made it work. I am sure this movie is destined to be little more than a footnote, but that doesn't stop me from enjoying it in the moment, and that may be all that is really needed.